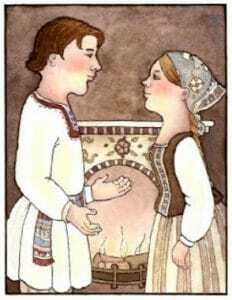 The Prince & the Maiden ~ Short Story for Kids No Reviews Posted. Once upon a time a king found himself lost in a forest. Try as he might, he could not find his way out. As he was wandering down yet another path which had turned out to be as hopeless as the rest, a man with a long, gray beard came toward him. “It’s my sporting dog who greets me first at the door,” thought the King. “I wouldn’t want to give up my dog. Still, the welfare of my kingdom depends on me and I must find my way home.” He turned to the stranger. “Very well, I accept your terms.” Scarcely had he uttered the words than he found himself at the great gates of his palace. Out rushed the nurse holding the royal baby, who stretched his arms to his father. The king, horrified, shrank back and ordered the nurse to take the baby back in the palace at once. When the king was able to consider the best way of handling the situation, he exchanged his baby, a beautiful baby boy, for the infant daughter of a peasant, and the prince lived roughly as the son of poor people, while the little peasant girl slept in a golden cradle, under silken sheets. At the end of a year, the stranger arrived to claim his property, and took away the little girl, believing her to be the true child of the king. The king was so delighted with the success of his plan that he gave splendid presents to the foster parents of his son, so that they might lack for nothing. But he did not dare bring back the baby, his true son, lest the trick should be found out. The peasants were contented with this arrangement, which gave them food and money in abundance. By-and-by the boy grew big and tall, and seemed to lead a happy life in the home of his foster parents, the peasant couple. But a shadow hung over him which really poisoned most of his pleasure, and that was the thought of the poor innocent girl who had suffered in his stead, for his foster parents had told him in secret the story of his royal birth and how he was switched as an infant with the peasant girl. “What can a beggar such as I promise anyone?” answered the prince. “Every day fresh food, meat twice a week, butter and vegetables, your summer and winter clothes, and a portion of land for your own use,” replied the stranger. When the prince stepped over the threshold of the master’s house he caught sight of a maiden of wonderful beauty, with brown eyes and fair curly hair. “What a treasure so deep under the earth!” the young man said to himself. And he watched her lay the table, bring in the food, and take her seat by the fire as if she never noticed that a strange man was present. The girl made a sign for him to follow her, and throwing open a door, nodded for him to go in. “It is impossible that she is his daughter!” he said to himself, “for she has a kind heart. I am quite sure she must be the very girl who was brought here instead of me, so I am bound to try to bring her back.” He got into bed, but it was long before he fell asleep, and even then his dreams gave him no rest. When he woke his first thoughts were for the girl, whom he found hard at work. To lighten her load, he drew water from the well, carried it to the house, kindled the fire under the iron pot, and in general, did everything that came to his head that could be of any use to her. Breakfast, dinner, and supper were as delicious as before. The prince would have been quite content with his quarters had it not been for the difficulty of keeping silence in the presence of the maiden. That evening he went to receive his orders for the following morning. “Oh, luckless being!” sighed the girl, “how will you ever get through with it? The white horse, who is our master’s grandmother, is always hungry. It takes twenty men always mowing to keep her in food for one day, and another twenty to clean out her stall. How, then, do you expect to do it all by yourself? But listen to me, and do what I tell you. It is your only chance. When you have filled the manger as full as it will hold, you must weave a strong braid of the rushes which grow among the meadow, and cut a thick peg of stout wood, and be sure that the horse sees what you are doing. The horse will ask you what it is for, and then you must say, ‘With this braid I intend to bind up your mouth so that you cannot eat any more, and with this peg I am going to keep you still in one spot, so that you cannot scatter your corn and water all over the place!’ Remember what I’ve said.” After these words the maiden went away as softly as she had come. Early the next morning he set to work. Soon he had enough hay to fill the manger. He put it in the crib, and returned with a second supply, when to his horror he found the crib empty. Then he knew that without the maiden’s advice he certainly would have been lost, and began to put it into practice. By mid-day there was still fodder in the manger, and the place was as clean as a pin. He had barely finished when in walked the old man, who stood astonished at the door. The old man grumbled, “You are truly a clever lad.” The prince shrugged and said nothing. “Oh, you are unlucky,” cried she. “Why, if you were to try from morning to night you couldn’t do it. There is only one way. When you go to milk her, take with you a pan of burning coals and a pair of tongs. Place the pan on the floor of the stall, and the tongs on the fire, and blow with all your might, till the coals burn bright. The black cow will ask you what is the meaning of all this, and you must answer what I am going to whisper to you now.” And she stood on tip-toe and whispered something in his ear, and then went away. The next day at sunup the prince went straight to the cow’s stall, and began to blow on the coals exactly as the maiden had told him to, till they burned brightly. The cow sighed deeply, and looked at the milkman with fear, but he took no notice, and milked briskly into the pail, till the cow ran dry. Just at that moment the old man entered the stable, and sat down to milk the cow himself, but not a drop of milk could he get. “Well, well, your abilities amaze me,” he said, frowning. Again, the prince said nothing. The world “wolf” was hardly out of his mouth than the white horse was off like the wind, so that in the twinkling of an eye all haystacks were gathered to the barn. The master was dumb with surprise as he came in after breakfast and found his man’s day’s work quite done, and he stomped away. The young man nearly jumped into the air for joy, but, remembering the rules of the house, he managed to keep still. When he told the maiden, he saw to his astonishment that she had become as white as a sheet. The Prince remembered the peas, which must have sprouted by now, that would lead them both back to the entrance, and he told the maiden of them. With one blow of his ax the prince split the barn walls. In an instant the place was filled with light from the red ball. The prince picked up the red ball and, before its brilliant light woke the black cow, wrapped it round with a thick cloth and hid it under his shirt. At the door stood the maiden, holding a little bundle in her arms. “Where is the ball?” she asked. “We must lose no time,” she went on, and uncovered a tiny bit of the shining ball to light them on their way in the dark night. As the prince had expected, the peas had taken root and grown into a little hedge, so the two of them were sure to follow the correct path. As they fled, the girl told him that she had once overheard a conversation between the old man and his grandmother, the white horse, saying that she was a king’s daughter, whom the old fellow had obtained by cunning from her royal parents. The prince, who knew all about the affair, was silent, though he was glad from his heart that it had fallen to his lot to set her free. So they went on till the day began to dawn. After repeating this many times, he jumped angrily out of bed to go in search of the culprits, but only found an empty house, and beds that had never been slept in. Then he went straight to the stable, where the sight of the smashed barn wall told him all. Swearing loudly, he cried to his goblin servants to go chase the fugitives. “Bring them to me, however you may find them, for have them I must!” he cried. So spake the old man, and the servants fled like the wind. The maiden and the prince ran on till they reached such a dark part of the forest that, if it had not been for the light shed by the red ball, they could not have made their way at all. Worn out and breathless, they came at length to a large stone, and here the ball began to move restlessly. The maiden, seeing this, exclaimed, “Listen to me, my ball. Please roll the stone quickly to one side that we may find the door.” And in a moment the stone had rolled away, and they had passed through the door to the world of fresh air again. The stone closed shut to cover the opening behind them. “Now we are safe!” cried she. “Here the old wizard has no more power over us, and we can guard ourselves from his spells. But my friend, now we must part! You will return to your parents, and I must go to the royal palace.” For you see, the maiden still believed that she had been born a princess and was stolen from the royal crib. The prince gazed at the maiden. He felt great satisfaction that she was now rescued and could resume her life in freedom. At the same time, he realized he had fallen hopelessly in love with her and did not want to part from her. “Stay with me!” he exclaimed. “Become my wife! I’ve loved you from the first, and I know that you love me, too. We’ve gone through so many troubles together; now we finally have the chance to share our joys.” The maiden knew in her heart that she loved him, too. At last she took his hand in hers and they pledged their love to one another. “Nay, my fair lady,” said the woodcutter, and he told her that the infant princess stolen by the stranger had been in truth a peasant’s daughter, and that the true royal child was actually a son who had been raised by peasants. So then the prince gently revealed that he, in fact, was the true prince, and that she was the daughter of peasants, and that he had journeyed into the cave with the sole intent of rescuing her. Disappointed though she was that she had not been born a princess, the maiden was pleased to know that the prince’s love for her was real, and that he had professed his love for her even though he knew that she was born a peasant. With the help of the magic ball, the maiden then managed that the prince become garbed in princely clothes so that he might greet his birth father, the king, in proper attire. She herself stayed behind so that the king and his son could meet in private. So the prince and the maiden were married, and they lived happily ever after. "The Prince and the Maiden" is based on a story named "The Grateful Prince" from The Violet Fairy Book by Andrew Lang (Longmans, Green & Co.: New York, 1922), pp. 77-97. Retold by Elaine Lindy. ©2000. All rights reserved.